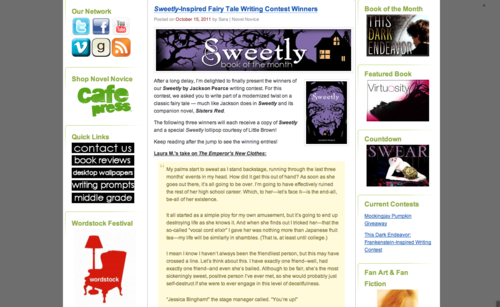 You may remember I entered a writing contest back in August in conjunction with the release of Jackson Pearce’s book, Sweetly. The prompt was to write a modern-day twist on a fairy tale, as Jackson does in her books Sisters Red (Red Riding Hood) and Sweetly (Hansel and Gretel). I’ve been checking back periodically to see if they’ve posted winners yet. Today somehow I was reminded of it and went to the website to search the term “Sweetly” and see if they’d posted results. I was surprised first of all to see a post containing the results (I had no idea when they were going to be posted). Here’s a link to the site if you didn’t catch my submission when I posted it on my blog. I felt the need to post this update in a timely manner, which conveniently gives me time to continue editing the blog I meant to post today, as I cannot seem to get it to say what I want it to. Anyway—all that to say I am very excited and encouraged by this! Also excited to get my lollipop that I won (and the book but the McClellans already own it, as evidenced by this photo of our excitement in the aforementioned post).